The Blue Jays took a 4-1 loss to the Oakland A’s with Sonny Gray on the mound. The minor leagues had some great performances and some not so great ones so keep reading! 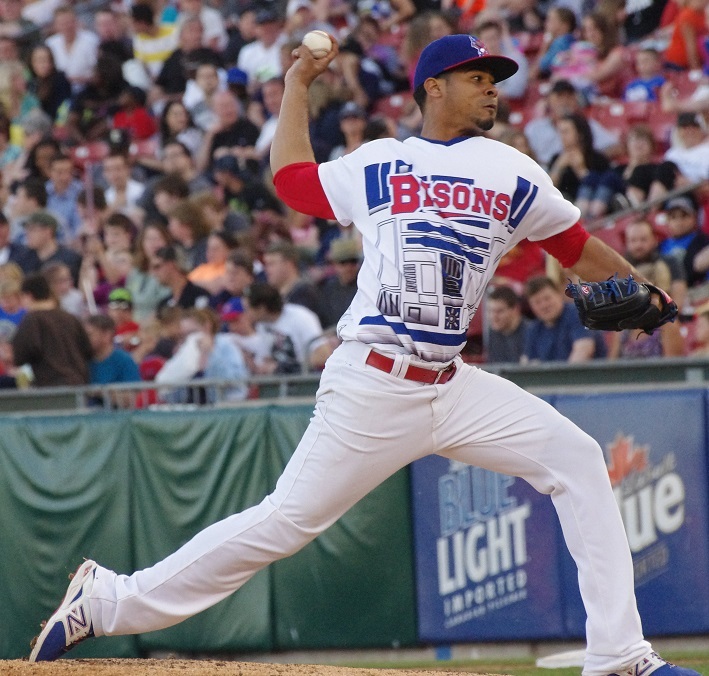 The Buffalo bullpen couldn’t hold on to the game for starter Esmil Rogers and allowed the RailRiders to score three late runs and take the lead for a win against the Bisons. Rogers only permitted one run to score, going six innings with four hits and three walks against and four strikeouts. The offense was pretty quiet with just four hits. Ryan Goins had two. The Dunedin Blue Jays broke out for 16 hits and beat the Clearwater Threshers 14-6 on the road. Ben White got the start and was okay, allowing Clearwater to score four runs over his five innings. Justin Jackson earned the save, giving up one run in three innings with two strikeouts. On the offensive side, everyone in the starting lineup had at least one hit with five players getting two. Nick Baligod was one of them, going 2/6 with a home run, a stolen base and four RBI. Andy Fermin was 2/6 with a triple, L.B. Dantzler was 2/6 with a double and two RBI, Emilio Guerrero was 2/6 with a double and an RBI and Kevin Patterson was 2/2 with three walks. Marcus Knecht was 3/5 with two doubles, a walk and two RBI. The Lugnuts managed to hold on to win this up-and-down game in which the lead changed hands four times. Jeremy Gabryszwski allowed 12 hits and seven runs over his 4 2/3 innings but was supported by Brady Dragmire who earned his third win of the season with 3 1/3 innings of stellar relief. The hitters had five different players get two hits including Anthony Alford who also stole two bases. D.J. Davis hit a single and a triple, adding a walk in his five plate appearances, Jason Leblebijian was 2/4 with a double and a walk and Derrick Loveless was 2/3 with two walks. 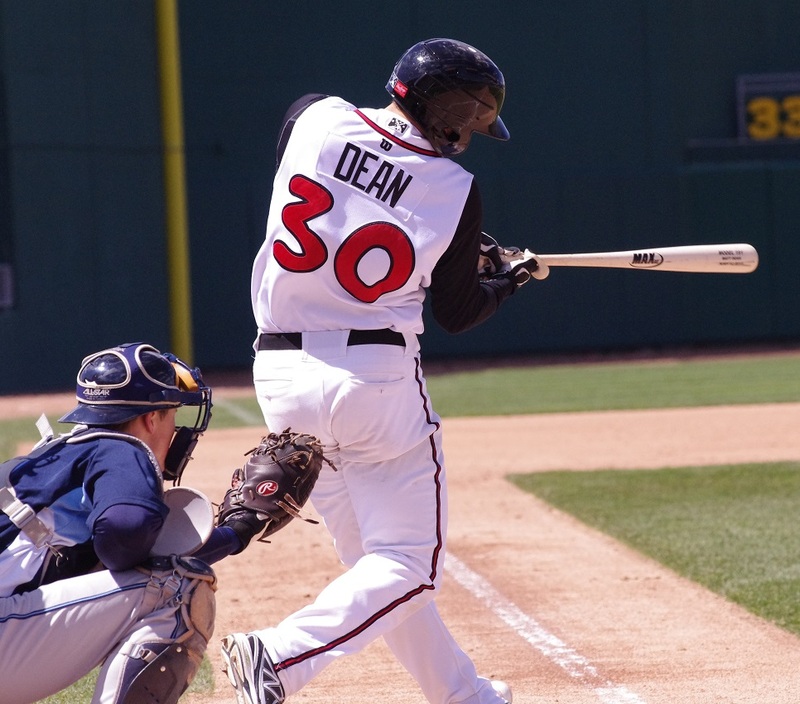 The big hit of the day came off the bat of Matt Dean who was 2/5 with a three-run home run and four RBI overall. Thanks to an epic comeback the Vancouver Canadians continued their winning ways, rallying to a 6-4 win over Salem-Keizer. Down 4-1 in the bottom of the eighth, the Canadians took their opportunity and jumped all over reliever Cameron McVey. Ryan McBroom and Boomer Collins went back to back with singles but McVey got Michael De La Cruz to strike out and retired Jonathan Davis on a fly ball. Seth Conner loaded the bases with a walk and Alexis Maldonado singled in three runs followed by a pitching change and a Roemon Fields triple to score Conner and Maldonado. Fields ended up going 4/5 on the day with two singles, a double and a triple, adding two RBI and two stolen bases (to give him 18 in just 20 games, getting caught twice so far). Boomer Collins, Michael De La Cruz and Alexis Maldonado were 2/4; De La Cruz’s game gave him a .333 batting average and will be looking for more playing time when Max Pentacost arrives. Franklin Barreto was 0/5 with three strikeouts and an error. On the pitching side, Jairo Labourt was very strong, throwing 4 1/3 innings with just one unearned run allowed on five hits and two walks with five strikeouts. Andrew Case threw 1 2/3 scoreless while Jose Fernandez allowed three runs over his two innings and Kamakani Usui came in for the save in the ninth after Brett Barber, the usual closer was ejected after hitting the only batter he faced. The Bluefield Blue Jays scored two runs in the sixth inning on a two-run home run by center fielder Josh Almonte and that was enough to see the club past the Elizabethton Twins for a 2-0 victory. Almonte had three hits overall and Trent Miller also had two. Miguel Burgos threw five scoreless innings, giving up just three hits and one walk with six strikeouts. Oscar Cabrera and Dusty Isaacs finished up with Cabrera really doing well, giving up just one hit and one walk over 2 2/3 innings. 19-year-old Jose Nova picked up his first win of the season, throwing five strong innings and allowing an unearned run on just one hit with five strikeouts. Yonardo Herdenez allowed another run over three innings, giving up just two hits and one walk. Pedro Diaz threw a clean ninth. Bryan Lizardo went 2/4 and an RBI while Jesus Severino was 1/4 with a walk and four RBI. While the Bisons haven’t published their starter for their contest against the Scranton/Wilkes-Barre RailRiders today, it’s likely to be Liam Hendriks, an International League All-Star, when the club plays on the Fourth of July in Scranton at 7:05 PM on MiLB TV. Casey Lawrence is expected to pitch for New Hampshire at home against Trenton as his start yesterday was rained out against Reading. Catch it at 7:05 on MiLB TV. Frank Viola III is going to make his first Dunedin start against the Clearwater Threshers against an exuberant (hopefully) home crowd at 4:15 PM. The Lansing Lugnuts have a home date for the US Independence Day holiday and will send proud Canadian Shane Dawson to the mound against the Great Lakes Loons at 7:05 PM. The Canadians will have Justin Shafer on the mound against the 15-6 Spokane Indians at 9:30 PM ET. Bluefield sends 6-foot-8 lefty Matt Smoral to the hill in Elizabethton at 7:00 PM ET.